Rosemary is best known for its use in cooking, but the herb has also been a part of folk medicine for centuries. 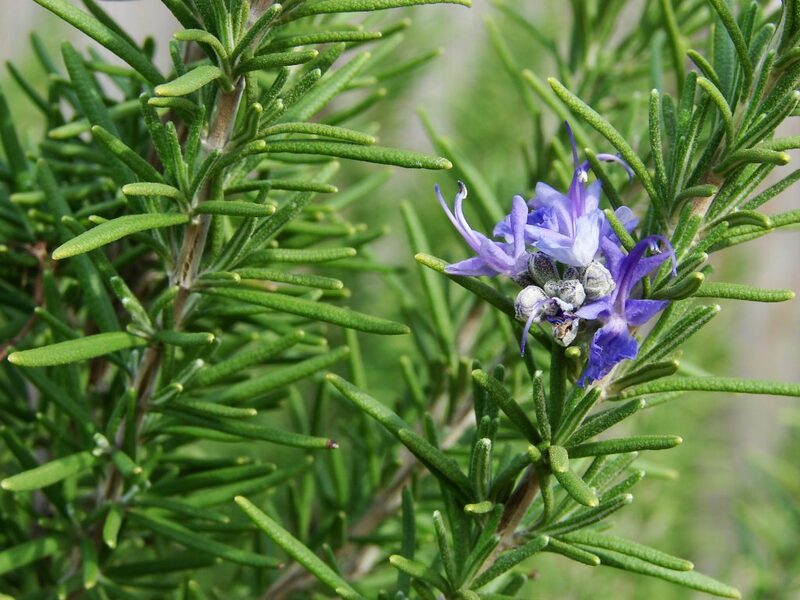 Rosemary essential oil is extracted from the leaves of rosemary springs. It has a woodsy fragrance that has become widely used in aromatherapy. Rosemary oil reduces stress and anxiety, boosts concentration and enhances memory function. It’s also a home remedy for ailments like indigestion, respiratory illnesses, hair loss and skin conditions. Using rosemary oil as an aromatherapy oil lowers cortisol levels to help you come out of “fight-or-flight” mode . Cortisol levels creep up when we’re stressed or have anxious thoughts, causing higher blood pressure and muscle tension. Chronically high cortisol levels increase your risk for several diseases, including heart disease and obesity. Research shows that inhaling the aroma of rosemary oil reduces biomarkers that indicate anxiety, like heart rate and blood pressure. In a study on test-taking students, rosemary oil aromatherapy was shown to naturally reduce stress . Historically, Greek scholars used rosemary oil’s aromatherapeutic effects to enhance their memory and thinking skills before taking exams. Recent research has supported this traditional use. In a study involving 144 participants, inhaling rosemary oil improved memory function and mood . Another study found rosemary oil reduced symptoms of cognitive decline in 28 elderly people with dementia and Alzheimer’s disease . While rosemary oil promotes relaxation by reducing cortisol levels, it’s also shown to increase alertness. This makes it particularly useful in high-stress situations. One study on 35 participants, everyone reported feeling more attentive, energized, alert and cheerful after inhaling rosemary oil versus inhaling a placebo . Rosemary essential oil has analgesic and anti-inflammatory properties than can help relieve headaches, muscle soreness, joint pain and other sources of pain. It’s great to add to an Epsom salt bath or combine it with a carrier oil and massage it into achy areas. By reducing inflammation and improving blood flow, rubbing some rosemary oil on your joints can reduce pain and stiffness caused by arthritis. In a study on people with rheumatoid arthritis, massages with rosemary oil reduced inflammatory pain by 50 percent within 2 weeks . This evidence suggests rosemary oil could potentially reduce the amount of medications needed to manage chronic pain. When taken orally in a small dose (2 to 3 drops), rosemary oil improves digestion by increasing the secretion of bile, which helps break down fats . You can also massage rosemary oil on your abdomen to help ease a stomach ache or treat irritable bowel syndrome, as it relaxes smooth muscles and acts as an antispasmodic. Rosemary oil also prevents erosion of the mucosal lining in your digestive tract, which protects against gastric ulcers . The antioxidants in rosemary oil are shown to protect the liver from damage. Rosemary oil also boosts your body’s own production of antioxidants, which provide further protection against free radical damage . As an antispasmodic and expectorant, rosemary oil can act as a natural cough medicine when you inhale it. It stops unproductive coughing and helps expel mucus from the lungs. This, combined with its antimicrobial properties, make it helpful as a natural remedy for respiratory illnesses. You can get these benefits by adding rosemary oil to a diffuser or applying 2 or 3 drops to your chest. Male pattern baldness, which can also affect females, is caused by a byproduct of testosterone that attacks hair follicles. By blocking the activity of this byproduct, rosemary oil allows balding areas to produce new hair growth . It also stimulates hair follicles by increasing micro-circulation in the scalp. This allows new hair strands to uptake nutrients and grow faster and stronger. Rosemary oil also adds luster, fights dandruff and slows the graying of hair. You can get all these benefits by adding to your shampoo and conditioner, or by rubbing it into your scalp as a hair mask and then washing it out after 2 or more hours. Rosemary essential oil has antimicrobial properties that make it effective against bad breath. Use it in homemade toothpaste, or add a couple drops to a small glass of water to use it as a natural mouthwash. By killing bacteria, it prevents the buildup of plaque that leads to cavities and tooth decay. It also fights gingivitis by reducing inflammation in the gums. Rosemary oil is a natural remedy for virtually any skin issue, including acne, dermatitis and eczema. Apply it directly to the site of a pimple or acne lesion to clear it up. By reducing inflammation, rosemary oil will start reducing the appearance of acne almost immediately. Its antimicrobial properties will tackle the bacteria causing it and its astringent qualities will help dry it out by reducing oil production. Add a few drops of rosemary oil to your moisturizer or combine 12 drops of rosemary oil with 1 ounce of witch hazel to create an all-natural, cleansing toner that controls oily skin. Preliminary research in test tubes suggests rosemary oil stops the proliferation of cancer cells and prevents the formation of tumors. While human studies on cancer patients using rosemary oil haven’t been conducted, it’s safe to say rosemary oil could help in the prevention cancer. Oxidative stress and chronic inflammation raise your risk for developing cancer. Rosemary oil is packed with antioxidant and anti-inflammatory compounds that help mitigate these risk factors . As pleasant as rosemary smells, it’s effective in repelling insects. One study found rosemary oil diluted at 12.5 percent repelled 100 percent of mosquitoes exposed to it for a 90-minute period . Besides repelling insects that pester humans, rosemary oil can also repel pests that infest gardens, eliminating the need for harmful chemicals . To combat stress and enjoy the benefits of rosemary oil aromatherapy, put a few drops in an essential oil diffuser, massage it on your temples and neck, or simply inhale in the bottle. You never need more than 3 or so drops a day if you’re taking it internally. However, most of the benefits of rosemary oil can be obtained topically or by inhaling its aroma. While there are no side effects at reasonable doses, essential oils contain powerful phytochemicals and should be used with caution. Combine rosemary oil with a carrier oil and patch test it on a small area of skin before applying it directly or to larger areas. When using essential oils, make sure they are 100 percent pure with no added ingredients.